I haven’t really spent any time in the sewing room since Tuesday! But I have gotten some more handwork done while watching some TV with hubby. 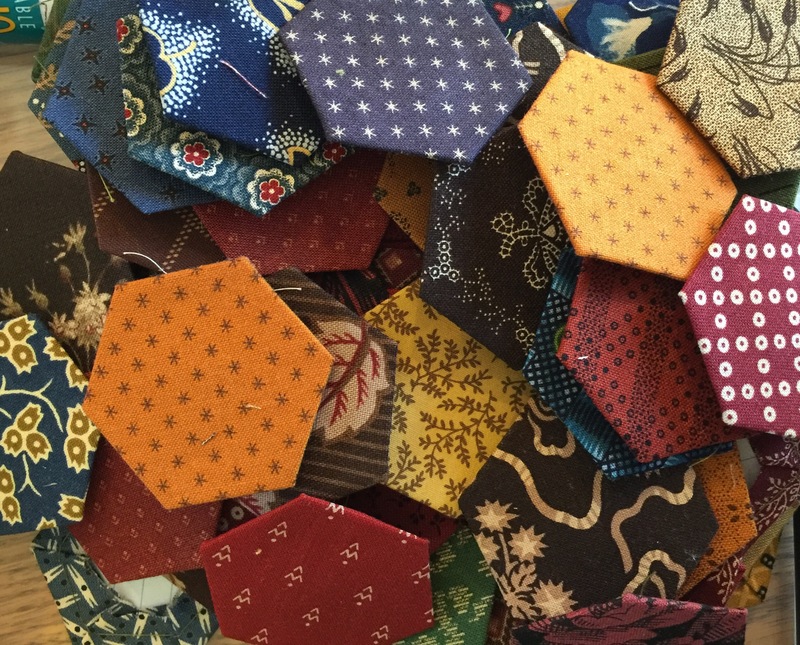 I’ve prepped some more hexies for Brinton Hall and started adding some of the scrappy sections. I’m going to try to get the mister to watch an episode of Foye’s War with me tonight. Maybe I can finish that corner I started. This entry was posted in Brinton Hall, Uncategorized. Bookmark the permalink. 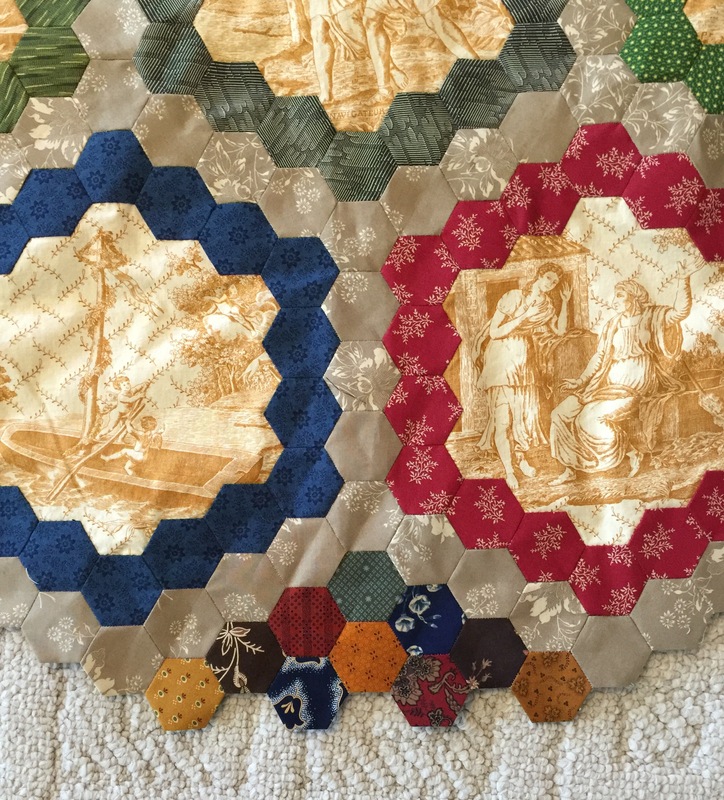 Beautiful colors…and the toile is great for the block centers! This is going to be a beautiful quilt!! You’re making really nice progress on your Brinton Hall … I’m loving it. 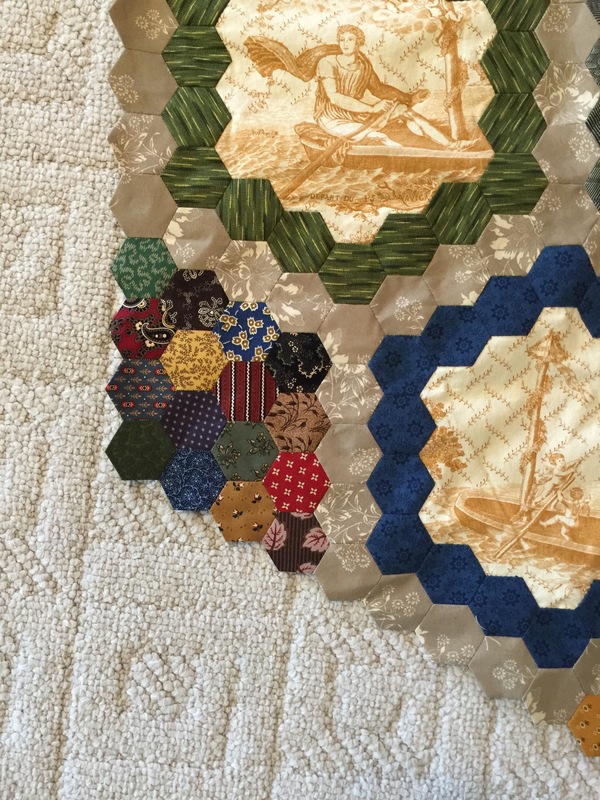 We had a speaker at guild this past week showing all of her hexie quilts. One of them was your project …it was huge! Keep sewing…I love the corners you are adding. I’ve never done any EPP and I’m not sure I ever will, but I admire those who do it. I have a friend who is an amazing expert at EPP. I love this project of yours, and the scrappy border really jazzes it up in a most wonderful way. I’ll enjoy to see as it continues to grow. That is going to be amazing! I am curious how you made the centers of the bigger blocks! I am loving the colors as well. This one is a fun one to watch grow. 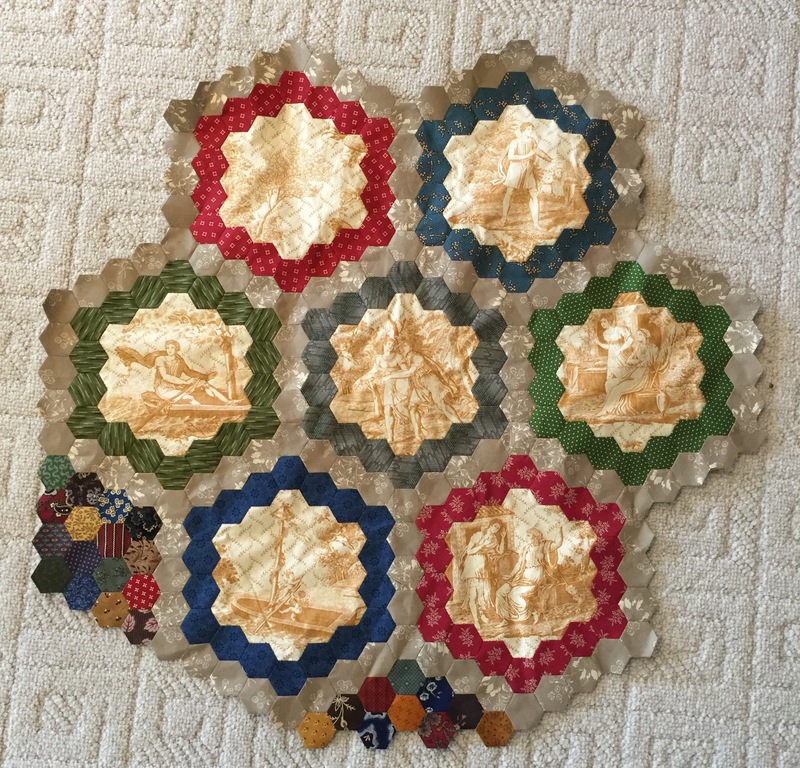 What a wonderful hexi project! Love the colors and the use of the toile. Hand work takes time but I know the feeling. Enjoy your stitches today! You are moving right along. I love the rich jewel tones. How big will your project be when completed. I loved Foyle’s War. Hubbie didn’t. Think he has trouble with the British accents; also it’s not sci-fi!! You are making lovely progress with your hexis, I’m enjoying watching it slowly grow!